This is an update to my post Climate Gate – All the manipulations and lies revealed 60. Here are some more very good examples of James Hansen and NASA doing the same thing as Climate Gate revealed that the CRU (Climate Research Unit at the University of East Anglia) is doing. This is the “official science” which there is “consensus” about and which cannot be criticized or questioned. Or even worse – asking to see the raw data or the tweaking of this data. This is what we, the common people, are supposed to pay TRILLION of dollars and reduce our living standard back to the Stone Age for. And that “our” politicians want to RAM trough at ALL COSTS! These corrupt people, the High Priests of the Global Warming Hysteria (to call them scientists would be an outrage against real scientists) should be removed. And that includes ALL the politicians who used this hysteria to promote their political agendas. We found a surprisingly large difference from the NCDC United States USHCN version 1 and the NCDC global GHCN for that station. The USHCN version 1 had an urban adjustment (Karl 1988) when it was introduced in 1990. The cooling was as 7F for July and 6F for January. Notice however as some state climatologists noticed, the annual adjustments began to diminish in 1999 and in version 2 of USHCN disappeared altogether. This led Steve McIntyre here to quip “If one reverse engineers this adjustment to calculate the New York City population used in the USHCN urban adjustment, the results are, in Per’s words, ‘gobsmacking’ (utterly astounding, even by climate science standards.” This was because, it could only be explained by a massive depopulation of New York City. The story doesn’t end there. The same NCDC maintains a global data base of station data used for climate change assessment called GHCN Version 2 of GHCN contains some of the same adjustments except for the Karl urban adjustment. Central Park is one of the GHCN sites. Note in the top graph above, it mysteriously warms not cools New York’s Central Park by 4F. GISS recently eliminated GHCN with USHCN adjustments as one of the data access options here. “We no longer include data adjusted by GHCN”. They do start with GHCN ‘unadjusted’ before they work their own homogenization and other magical wonders. 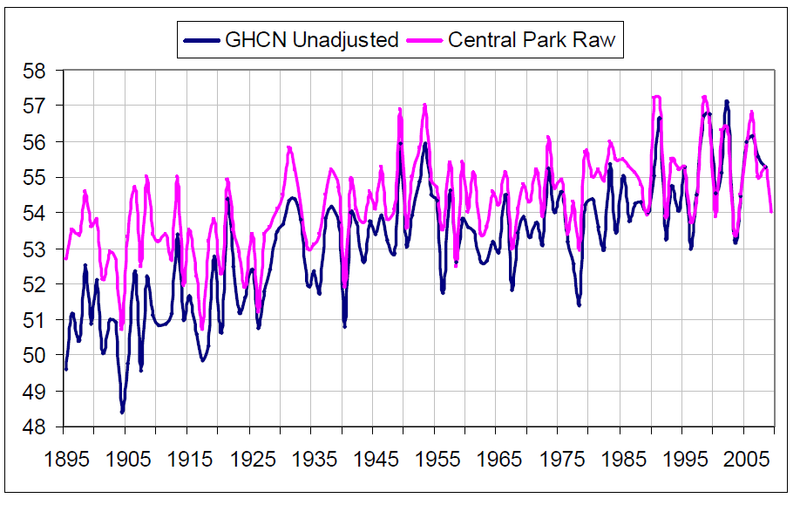 I downloaded the Central Park ‘unadjusted’ GHCN data from GISS and did a comparison of annual mean GHCN with the raw annual mean data downloaded from the NWS New York City Office web site here. We found that the two data sets were not the same. 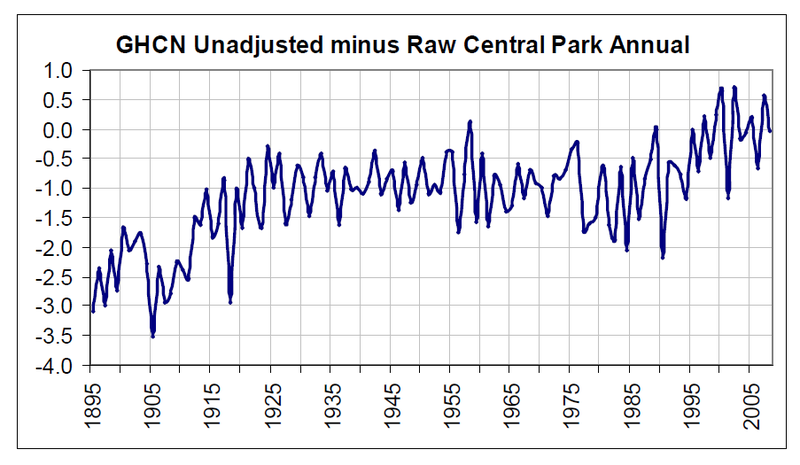 For some unknown reason, Central Park was colder in the unadjusted data sets in the early record as much as 3F than the raw observation records. The difference gradually diminished so, currently the changes are small (2008 was the same). Some recent years the ‘unadjusted’ adjustments were inexplicably positive. The difference is shown below. Thus in the so called unadjusted GHCN data, the warming (due to urbanization) is somehow increased from 2.5 to 4.5F by NOAA. Anyone observing ANY DIFFERENCE? And this HUGE DIFFERENCE of course just happened by “chance”. One of their famous “reconstructions” or Mike’s (Michael Mann) nature “trick”. 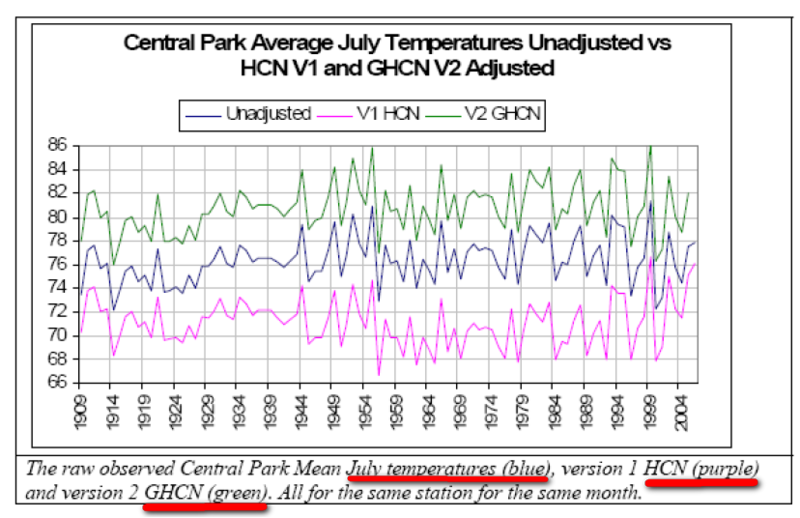 And isn’t it interesting that NCDC claims that the weather station in Central Park was artificially warmed by 3 degrees in 1900 by its urban location, but isn’t affected today. And that they call the adjusted/tweaked data for “unadjusted”. My friends, THIS IS “science” at work – or more appropriately Global Warming Hysteria told by the high priest of that cult. The BIG problem is that WE HAVE TO PAY THE HUGH COST FOR THIS LUNACY. This entry was posted on 14 januari, 2010 at 11:15 f m and is filed under Fri- och rättigheter, Miljö - Environment, USA, Yttrandefrihet. You can follow any responses to this entry through the RSS 2.0 feed. You can leave a response, or trackback from your own site. I think I have simplified the issue in an entertaining way on my blog which includes some issues connected with climategate and ”embarrassing” evidence.